Much furniture and fun is upon us! NeoCon 2016 will run June 13-15 at the Merchandise Mart and — aside from a whole host of seminars, workshops, and tours — it’s the industry’s annual opportunity for a close-up look at the latest products and prototypes. Also: showroom parties. Frankly, it can all be kind of overwhelming. To help you get the most out of your experience, we’ve reached out to Mia Lewin, the CEO of Kontor — the database of workplace images and go-to search tool for discovering the latest products — to get her take. What are the buzzwords that you think will be on everyone’s lips during (and in the months following) NeoCon? We declared last year the “Year of the Standing Desk”, or more precisely, the adjustable height desk. It seems like every brand was doing its own riff on the form. And though it has been a trend for a while, we think the “flexibility” embodied by those desks will be on everyone’s minds again this year. Beyond desks that go from sitting to standing, we’ll see a lot of furnishings that will enable designers to create versatile workplaces that can easily adapt throughout the day, as teams go from collaboration to presentation to heads-down work. You’ve teamed up with Knoll to launch of their new collection, Rockwell Unscripted, and it looks really cool! What’s new and noteworthy about this collection, in particular? How do you think it will “work” in the workplace? Rockwell Unscripted is amazing because it picks up on that sense of flexibility. The many components in the collection can be easily recombined and reconfigured to suite different uses in a given day. But no matter how you put them together, they have a distinct aesthetic and way of organizing space that sets a scene. Do you see any synergy between the most searched for products and types of space on Kontor and the new products that are slated to be debuted this year? 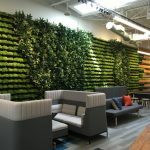 We see tons of searches for kitchens, lounges, and living room-like spaces showing the continued influence of residential design on the workplace. Many of the furnishings that we’ll be featuring in our NeoCon Guide pick up on that domestic aesthetic. People are looking for products that are both comfortable and make a statement. Say it’s a young designer’s first time at NeoCon. Which three manufacturers would you suggest as must-sees for this young designer and her client, and why? In no particular order: IdeaPaint is introducing a collaboration with Primo Orpilla from Studio O+A that we’re excited to see. We can’t wait to climb BuzziSpace‘s BuzziJungle, a playground-like series of perches by Jonas Van Put. Uhuru has been doing great work with inventive and functional pieces for its Essentials Workplace collection. And we’re excited to see the return of West Elm Workspace after a strong debut at NeoCon last year. There you have it! Wishing you all a rollicking good time at the Mart. We hope you’ll follow along as we Tweet and ‘gram our way through the showrooms and seminars (#NeoCon16), and be sure to check back after the show for our recap!